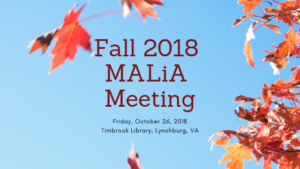 The Fall 2018 MALiA Fall Meeting will be Friday, October 26th from 10am-2pm at the Timbrook Library in Lynchburg, Virginia. Public Services Librarian Dana Bomba will present on both management and being a “jack-of-all-trades” in the library. To register, go to https://goo.gl/forms/tDJdpF5ikc6geRaR2. Assorted pastries, juice, and coffee will be available in the morning. In the afternoon, you can select a meal from Panera Catering, or opt to provide your own lunch. Lunches from Panera will be $10, and payment is requested at the meeting. For any questions, please contact Emily Correa, ebcorrea@co.campbell.va.us, 434-369-5140.